Alexander had a problem. He didn’t know how to tie his shoelaces. His mum or dad tied them in the morning, but they soon came untied. Alexander had to ask them to tie them again and again. One sunny afternoon, Alexander went to the park with his grandma. She pushed him on the swings and they had a picnic lunch. Alexander ate sausage rolls, ham sandwiches with pickle, and potato crisps. When he had finished eating, he ran around in the park while Gran read a book. He didn’t notice that his shoelaces were untied until he fell flat on his face, landing in the tall grass. He was about to cry when he spotted a ladybug. It was red with black dots on it and had wiggly antenna. 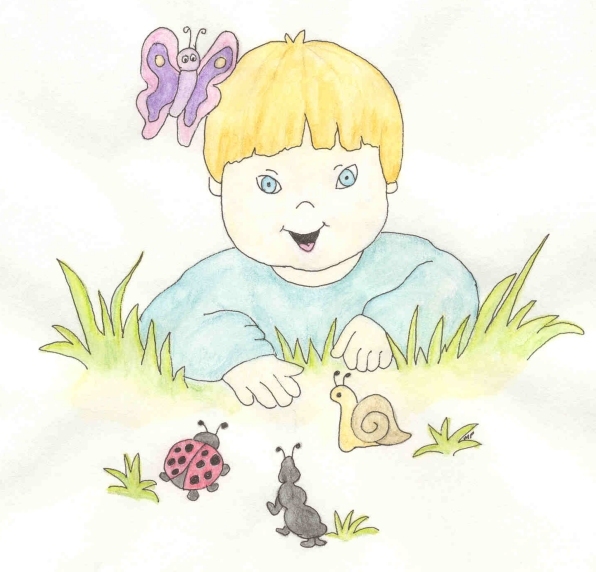 Alexander didn’t know ladybugs lived in the grass. He tried to touch the ladybug when he saw a black ant. A snail came crawling by and then a butterfly flew out of the grass and landed on Alexander’s head. He giggled as he watched the insects crawling about. Gran walked over to see if Alexander was hurt but found him laughing at the bugs. She lay down on the grass next to him and watched them too. It was soon time to go home. Alexander didn’t want to. He wanted to stay at the park. Gran tied his shoelace and they walked home. He couldn’t wait until the next time he went with his gran.